Add chilies, sugar, water and salt to small pan and bring to boil. Simmer for 5 minutes over low, reduce by half and strain. Cool to room temperature. If too thick, add a pinch of water. Drizzle over ham, preferably G&W Hammery ham from Tennessee. Set oven to 450°F. Mix coriander, brown sugar, pepper and salt together. Rub on pineapple, place on sheet tray. Roast for 5-7 minutes or until it starts to char slightly. Set onion in glass bowl or jar. Bring vinegar, water, bay leaf, salt, sugar, chili flake to simmer. Pour over onion. Let cool to room temperature. Let cool and dice to small pieces. 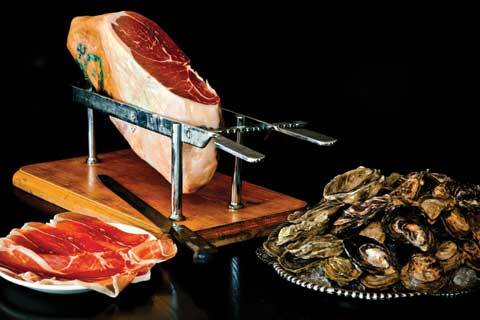 Serve with La Quercia Picante cured ham from Iowa.